What is the biggest reason as to why Oregon has lead the Pac-10 and been one of the nation’s leaders in rushing since the Spread Offense was introduced at Oregon? You may recall that a crucial component to the success of the Zone Read is when a Defensive End is left unblocked and “Read,” on the backside of the play. Since the play is going to the other side (hence being called the Playside) the blocking responsibilities shift one player over to that playside for the Offensive Linemen. The result is an extra blocker on the side that you’re attacking, and THAT my friends is a HUGE advantage that teams have had difficulty defeating. While ESPN or FOX haven’t picked up on it over the last SIX years, we as feathered friends have learned and discussed it on assorted Duck Media/Message Boards. Teams are defending the Spread Offense better with a variety of stunts, and now as they are feeling better about facing it? Coach Kelly unveils a new innovative approach to offset their adjustments by creating a blocking advantage within the Spread Offense through our Offensive BACKFIELD instead through the Offensive linemen. You gotta be kidding! We have to remember that change is Chip’s forte such as the Interchanging Inside Zone Read vs. Bubble Screen strategy seen in the Stanford game of attacking the middle, the edges, and then downfield. Consider the “Cal” counter-to-the-counter strategy introduced in the Arizona game with a change in blocking schemes; the bottom line is that Chip likes to mix it up for the opponent. He will introduce something for a game or two, and then put it back in the tool box for another day. The question is whether the new formations/plays are simply tools or a fundamental shift in the offensive strategy? 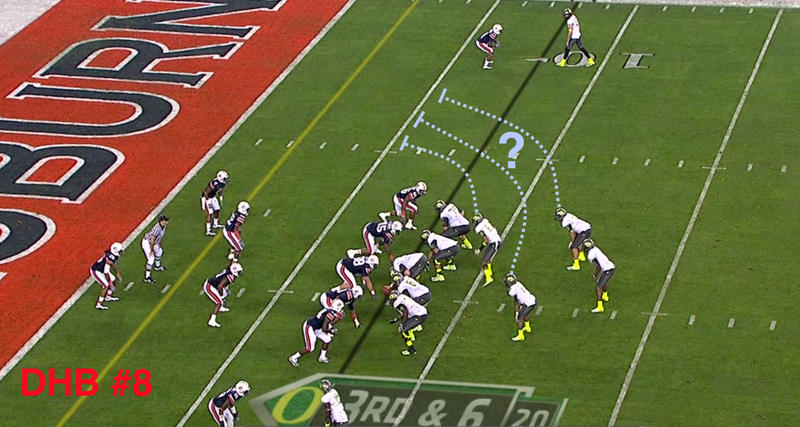 I believe the answer resides in the attacking philosophy of the new “Dual H-Back” formation. If we go to 10:06 in the 1st Qtr (Picture #1 above) we see two WRs on the left, and two DUAL H-BACKS positioned on both sides of where the ball is snapped. They are about halfway back between the center and the QB and with the ball shotgunned back to Thomas—they can go anywhere. On this play we see one of the WRs (the Tazer Barner) go in motion from left to right as a RB for the Outside Zone Read to the right. 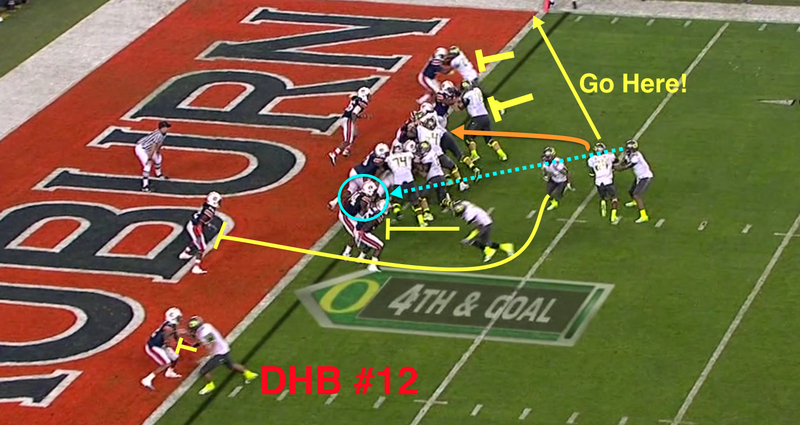 When the ball is snapped the H-Backs go left (Pic#2) to block downfield on the outside for in case Darron pulls the ball after Zone Reading the unblocked DE of Auburn (Orange Circle) and determines that the DE is going to chase the Tazer in that instance. The Tazer in motion is passing in front of Darron; what we see is an Outside Zone Read going to the right with the motion man being the RB, yet we have conflicting motion going the other direction from the H-Backs. If Thomas had pulled the ball (See yellow dotted line) and charged HARD outside to the left–then he would have beaten the DE to the corner and with two H-Backs and a WR blocking, (an impressive wall to the left outside was set) he would have gained a nasty bit a turf on the Tigers. Instead, (Pic#4 above) Thomas pulled and hesitated, thus the DE gained an angle to deny the outside and Thomas had to run wherever he could and lost two yards. 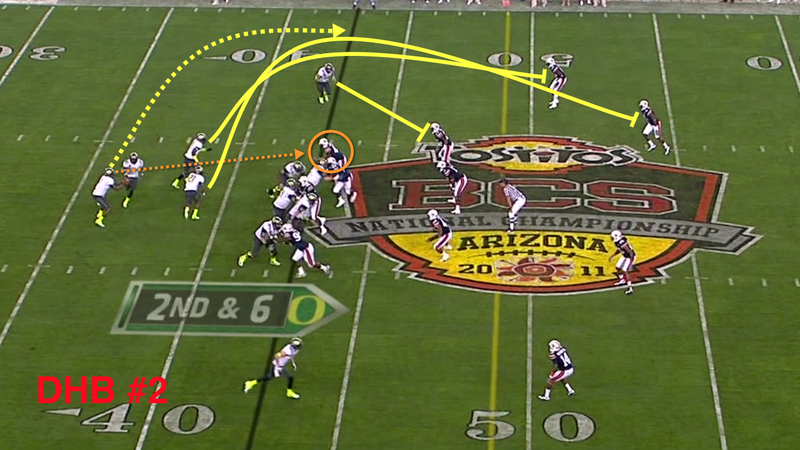 It was another example of how the play could have worked EITHER direction, but execution muffed it up. I LOVE this play and we WILL get better at it! We see the first variation of the “Dual H-Back” formation at 6:34 in the first quarter (Pic#5 above) as we see both H-Backs going left while we had two WRs on the left to start the play with one of them (a TAZER) coming in motion left to right in front of the QB on an Outside Zone Read (orange line) of the Auburn’s right DE. Note how well the Offensive linemen have sold the running play as they kick-step to the right as they normally would on an Outside Zone Read to the right. When their shoulders turn like that—it is an Outside Zone Read Play. This looks like the prior running play I just described, but Thomas fakes the handoff and rolls out left! The two H-backs have gone out into pass patterns to the left with one at middle depth, and the other H-Back that was on the right side to start the play flares out in the left flat. Darron hits the near man and LaMichael runs for an easy first down. See how open Davis was as well? Sweet play action pass off a running formation and what I didn’t notice until watching it for the fourth time? In addition to Davis being open, we see Maehl (Above) was open over the middle deep as he went from right to left in his pattern. Good running formations like this CREATE passing opportunities! We love it! We see another impressive variation of this formation at 11:05 in the 2nd Qtr (See pic #8 above) as we see the Dual H-backs lined up with a man in motion going left to right and one of the H-backs is going to the right at the snap, thus it worries the defense as to whether you are going to have a power blocking formation turning the corner on them, ala Stanford style. They become conscious of run defense inside the ten yard line that defenders don’t notice leaky pass protection until Darron throws left for a screen pass Touchdown to the left H-Back, who was LMJ! 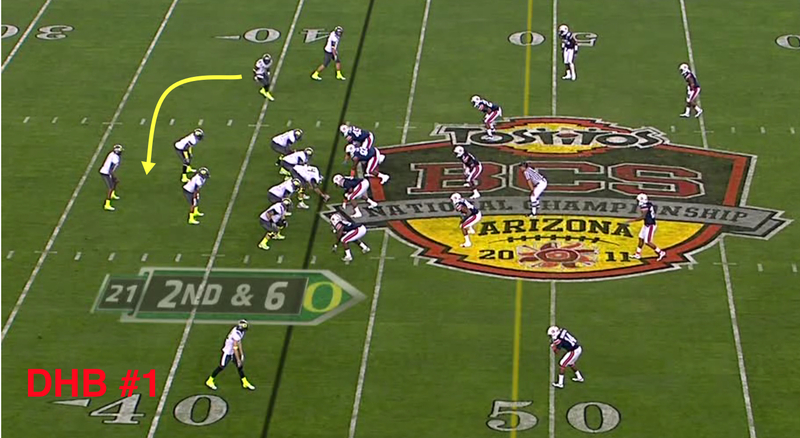 The defense has to be so aware of the running possibilities with this formation that passing from the play-action becomes a high probability success result for Oregon. Dual H-Backs inside the ten yard line shouts power play as you can concentrate your blockers to a side and defenders don’t know where you are attacking. Washington State scored a TD against us on the ground pounding us with a somewhat similar set although their H-Backs stood side-by-side to the QB. An Outside Zone Read going one direction against the flow of a power group (the H-Backs) as we have just discussed is an intriguing new twist to the usual Outside Zone Read that we have become accustomed to seeing. It sets up some interesting possibilities when we are in the Red Zone and at 3:06 in the 3rd were examples back-to-back. (See pic #10 above) We are on the six yard line and threatening to score when we line up in the Dual H-Back look; we have a slotback (Barner) coming in motion from the left to the right and at the snap we have BOTH H-Backs going left with Darron Thomas the QB, following them. The QB is Zone Reading the “blued” DE as Barner zips by going the opposite direction of the flow and the strength of the formation. 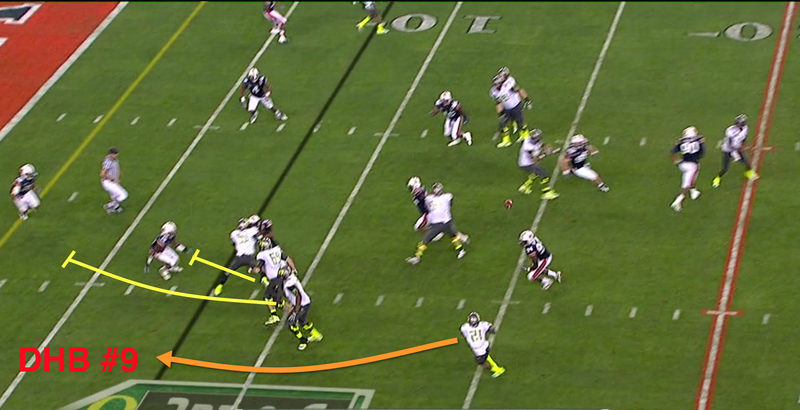 Like the usual Outside Zone Read, the RB has the choice to turn upfield wherever he sees the hole open up. On this 3rd down play, (Pic#11 above) Barner sees the DE on our right side coming outward to stop the run around the right end, but his movement outside created a hole inside the D-Line, and thus the RB ran for almost six tough yards to the one yard line. Barner ended up in a Guard/Tackle hole inside from an Outside Zone Read to the right against the power motion going left. The problem was the next play, fourth down. (Pic#12 above) Coach Kelly elected to run the same play? There is Zone Read on the left side (Blue line to Circled DE) where the power is moving and had Darron kept the ball he might have scored easily with the nice wall of blocking to the left materializing. 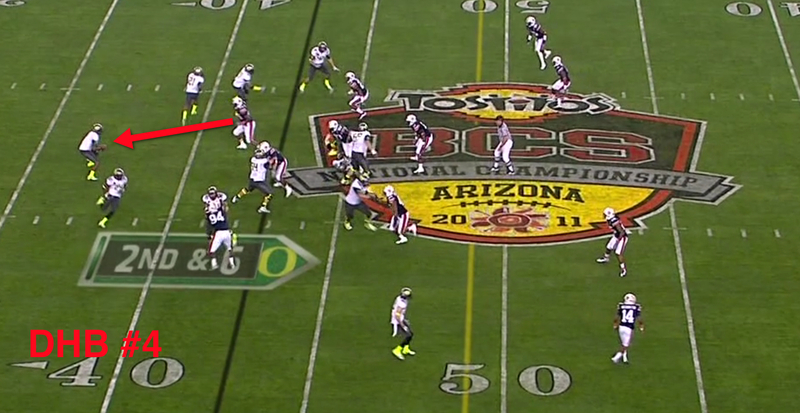 However Thomas saw the DE sit, thus he is to hand off again to Barner going to the right. 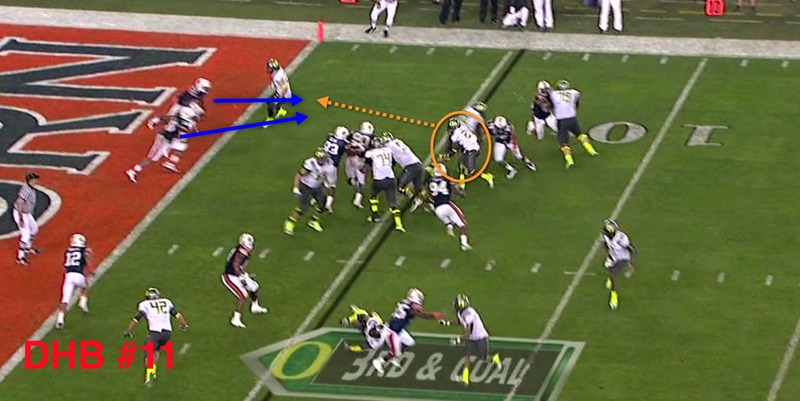 At the moment of the handoff—the blocking on the outside right has wonderfully sealed off the defenders. 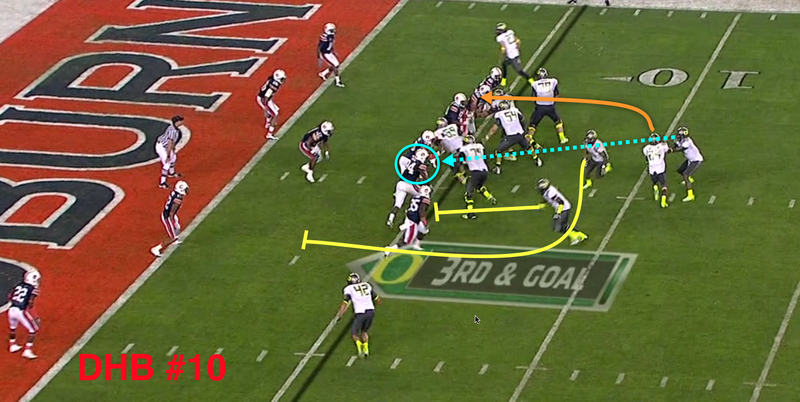 (Yellowed Ts) If Barner takes the ball and runs for the pylon, (Yellow line) it is an easy score. Instead he clearly made up his mind as he took the handoff that he was going up the middle again, (Orange line) and it wasn’t there. See how he was already turning his shoulders inside as he had just got the ball. We were stopped short of the goal when we could have scored outside right by Barner OR outside left by Thomas as you look at the blocking. It’s a good example of how the play was blocked well, how it was a good play call after all, and how we muffed it up with our own decisions again! This new formation suggests a ton more is going on with Chip’s Offensive Philosophy than we might consider from our first exposure to it. When both H-Backs are lined up with one on each side of where the center is snapping the ball—it doesn’t allow the defense to know which side we are going to, hence they have to line up balanced to counter it. 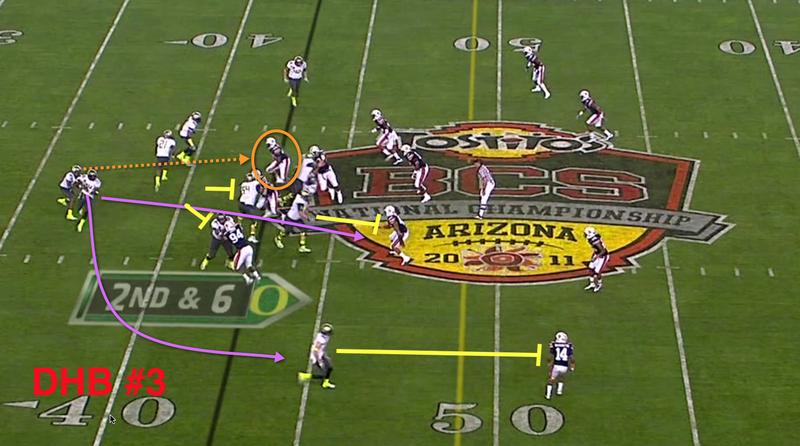 Then, when we move those H-Backs one direction we create a numerical advantage with our blockers on one side! Chip has gone from creating an extra blocker on the LOS with the Offensive Linemen to creating an extra blocker on one side from what we have positioned in the backfield! These are actually the fundamental components of the Wishbone from the 70s and 80s; line up balanced and attack one side to create a blocking advantage while using Optioning components to create further difficulties for the defense. What is the end result when we line up in the Dual H-Back formation (which looks like an inverted Wishbone from behind) and run to one side generating a blocking imbalance and yet implementing a Zone Read at the same time? That’s like a SHOTGUN WISHBONE approach my friend! Holy Crap. The recruiting again continues to make more sense as an abundance of TEs (H-Backs) are going to be needed, and it will be a ton of fun for them to play in this offense. Imagine if you’re an Oregon opponent and as an Outside Linebacker-what you see coming around the corner are two 6’5″ 250 lb. H-Backs in White, Paulson, French or Lyerla coming up with head of steam and looking to hurt you. (I’m looking to take a dive) Or they could blow past you for an open pass as you brace for the blasting block. Sometimes an H-Back is actually a RB who is going out for a pass, coming in motion as a handoff or pitchman or moving inside for a shovel pass. Two RBs on the field will become common for us! 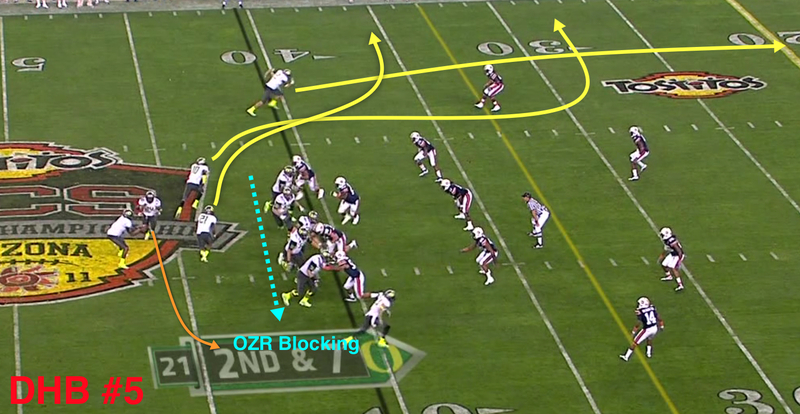 I love the new Dual H-Backs and the Slash formations in how they attack a defense inside and outside, in either direction, or vertically downfield via the pass while retaining the consistent component of having a numerical blocking advantage on the side we’re attacking. Way too cool. I am picturing the defense’s difficulty in defending the entire field, getting lined up properly, and doing this during Oregon’s gasping No-Huddle regimen? The potential to create errors by the defense just went up significantly! Are we really running a “Shotgun Wishbone?” No. Just as the play in another report about the Slash formation where the H-Back/TE was leading the way for the RB like a traditional “I” offense doesn’t mean that we’re running an “I” or a Wishbone, but borrowing some of their concepts for Chip’s overall unique attack. Yes, I hope these additions are permanent to the offense as the entertainment factor will go up another full level as the wonderfully talented skill players make use of their gifts in open space. I’ll be watching for these formations in fall camp and in the games!